Nitrogen is the seventh element of the periodic table. These nitrogen facts contain chemical and physical data along with general information and history. Atomic Mass: [14.006 43; 14.007 28] IUPAC guidelines. For single value, use 14.0067. Rutherford’s teacher, Scottish chemist Joseph Black was working on the chemistry of air. When he removed the oxygen by burning phosphorus. He found there was still some gas left over. This mystery was left as an exercise for his student. Rutherford continued by removing the carbon dioxide from the air and showed the remaining gas did not support life or further combustion. He discovered the remaining air was insoluble in water and alkali solutions. He called his air “noxious air”. Name Origin: Nitrogen’s name comes from the Greek words nitron and genes meaning niter and forming respectively. In 1790, French chemist Jean-Antoine-Claude Chaptal noticed the gas was part of the substance niter (potassium nitrate). French chemist Antoine Lavoisier called the gas azote from the Greek word azotos meaning lifeless. Several countries still use the name Azote for nitrogen in general use. Natural nitrogen is comprised of two stable isotopes: N-14 and N-15. Fourteen other isotopes have been produced under laboratory conditions ranging from N-10 to N-25. 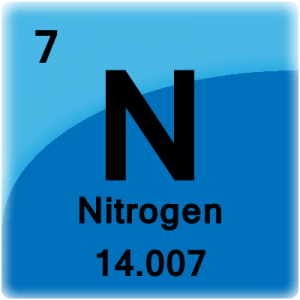 Nitrogen-14 is a stable isotope containing 7 neutrons. 99.636% of natural nitrogen is nitrogen-14. Nitrogen-15 is a stable isotope containing 8 neutrons. 0.364% of natural nitrogen is nitrogen-11. 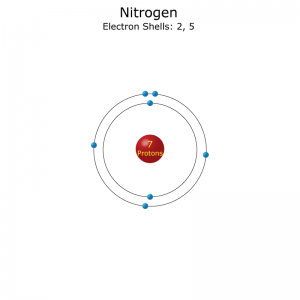 Electron configuration of a nitrogen atom. Nitrogen is a colorless, tasteless and odorless gas. Nitrogen is not found as a single element in nature. It bonds to itself to form the diatomic compound N2. 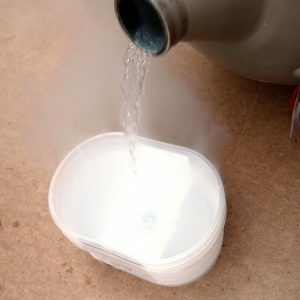 Nitrogen gas makes up 78% of our atmosphere. Approximately 49 million tons of nitrogen are removed from the atmosphere to produce ammonia. Group 15 on the periodic table is also known as the nitrogen family. An older name for the group was pnictogens. Pnictogen is from the Greek word pnikta meaning “to choke”. Nitrogen is used to protect goods from oxygen. The ‘air’ in your potato chip bag is mostly nitrogen. About 3% of your body weight is nitrogen. It is also the fourth most abundant element in the human body after oxygen, carbon and hydrogen. Nitrogen is a key component of amino acids. There is nitrogen in every part of your DNA. Nitrogen gas is relatively inert. Soil bacteria can ‘fix’ nitrogen into forms plants use to grow. Nitrogen is responsible for the vibrant orange-red, blue-green, blue-violet, and deep violet colors of the aurora. 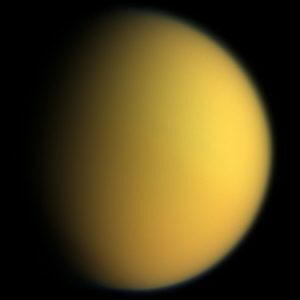 Saturn’s moon Titan has a dense atmosphere comprised almost entirely of nitrogen and nitrogen compounds. The yellow-orange haze (see picture) is caused by hydrocarbon smog suspended in the atmosphere.